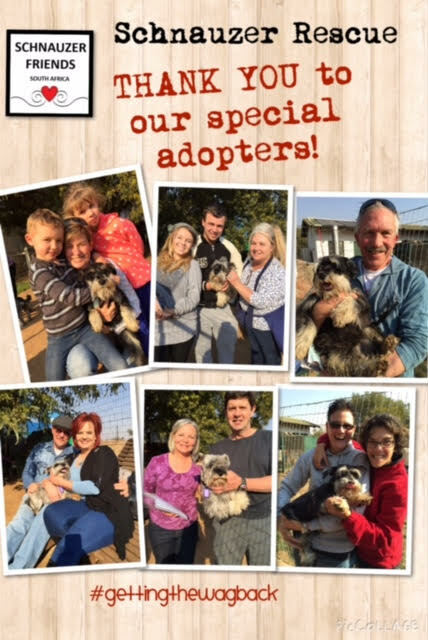 On the 20th June 2015, Jess-Ndo St Madonna was adopted at one of our Schnauzer Friends South Africa adoptions days. She was an ex Roodewal Kennel contract breeding mom and had only ever lived outside in the cold and rain! She was marked as a Category 3, which means she is very very scared and needed a special mommy who would be able to understand and rehabilitate her to trust humans again. This blog will follow the progress of Jess-Ndo St Madonna and her new forever mommy Deona. ENJOY!!! What is a Category 3 - We have been battered and bruised, our hearts are very sore, most of us are extremely scared and will run away until we gain your trust. One or two of us are angry and scared at the same time so might just nip you if you try too hard to fast. But we still have hope in our hearts that some humans are kind and caring. 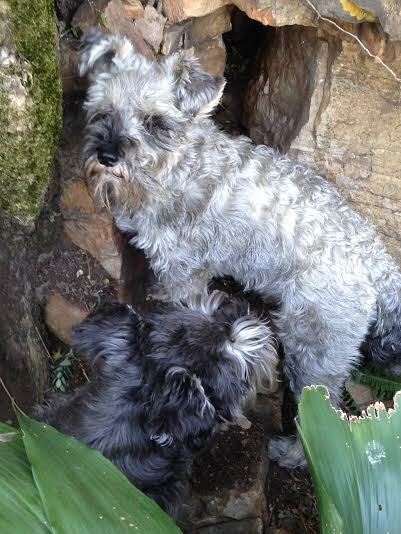 (We will need special humans to help us, humans that have previously worked with lost souls like ours, we have not lost all hope yet and there is still time to save us - Schnauzer Friends can be contacted to assist in this process and give advice. Adoption Diary: Jess-Ndo St Madonna. Phew!! What a day! We were transported from the farm to Woodrock Animal Rescue where we were met by some Schnauzer friends. They were people interested in giving us loving homes. They milled about us; picking us up, cuddling us, coercing some of us from the kennels we were resting or hiding in after the tiring trip. I crawled into the furthest corner of one such a kennel with Megga and Spice, hoping no one would notice me, as I was just so tired and scared of it all, when a couple spotted us. And oh, dread! Me! Really trying to blend into the background! (Not easy if you’re silver and really beautiful.) But then Megga came to the rescue - no pun, really!- and distracted them. They also mentioned Spice having almost the same name as them (Spies) and I thought I was off the hook, because I feared any more disruption. But the woman kept looking in on me, saying that she saw something special in me. That I was lovely. And eventually, in spite of doing my best to be inconspicuous, I was bundled into her arms, made to promise to be a good dog, while she was made to promise to take good care of me, and I was carried of. I’ll be lying if I said the drive was horrible. I laid cradled in her arms and she cooed compliments and reassurances all the way. In between they were talking about Scully this and Scully that and eventually I gathered that they were talking about another dog. My tummy tied in a knot. Is it a friendly dog? Will we get along? I wished I could just go back to all that was familiar to me. After what seemed like eternity, we stopped and I heard a dog barking. I supposed it was Scully. It sounded friendly and excited enough, but how would he react to me? Well, what a surprise! He greeted me like we were old friends, and then spoiled it all by wanting to become too familiar. I mean, really! Hasn’t he heard of romancing a girl? But you know, I’m really too tired to go into the details of it all now. I’ll recount the rest tomorrow. I have a full tummy and a comfy bed and I hope it is a sign of more good things to come. friends. Megga and Spice whose bodies next to me gave me such comfort. I also worried about them finding homes. And poor Sonda; I do hope she gets adopted into an active household. She has weight problems. What will become of all of them? But back to my situation; I woke up this morning feeling really scared. When mom picked me up to take me outside I went rigid with fear. And of course Scully immediately started with his antics. But, boy! Does he need a biology lesson. Lucky for me he doesn’t really have a clue. Don’t get me wrong though. He is very handsome and I wish I met him in my friskier days. But you know, I have been there and done my fair share of nurturing. It’s my turn now to be pampered. As the morning progressed he seemed to relax about me being around. I still get hugs and licks from him, but he isn’t as relentless. I was served a nice breakfast and given time on my own again. After that mom carried me out into the garden once more and I started exploring. Believe me if I say it will take some time getting used to this place. A dog can go nowhere here without having to climb some stairs. But I’m managing that just fine. I also discovered another door to go back into the house and I found the room where the three of them slept last night. I wonder if I’ll be allowed to join them tonight? I suppose that will depend on how Scully behaves. He got my tail wagging just now, and I now walk around proudly, with my tail up in the air where it belongs. Mom asked if she can write a few lines so I’m handing over to her. Maybe she wants to gossip about me. I woke this morning to compliments being showered on me. Early morning I went outside through a little dog door to do my ablutions and Mom thought that was very clever of me. She expected a few mishaps but I had only one Saturday night, and that was just because Scully never gave me a private moment. But, oh dear! The adrenalin that buoyed me up yesterday, has disappeared and I’m feeling flat and depressed. Mom introduced me to the domestic worker, Elizabeth and the gardener, Glen. Scully had lots to bark about when he saw Glen. He rushed out and gave him a stern warning to remember who’s the boss around here. And it’s not Dad. Mom carried me down to the kitchen and gave me breakfast. Dad left for the office. Mom took me outside but I made a beeline back to my bed. Mom and Scully got very busy with heaven knows what. She would say: “ Come Scully, let’s fetch a screwdriver. Let’s go and put food out for the birds.” Scully would race out ahead of her. He doesn’t seem to have any half measures. He does everything flat- out! I’ve chosen a spot under a table on a landing to sleep and mom put my bed there. It’s right in the middle of the house and they went back and forth past my bed. I could observe them and not feel excluded. At one stage I went looking for Scully and gave him a friendly wag of my tail, but then I saw Mom busy behind him as he is never far from her. I just can’t help it, people unnerve me - so I went back to my bed. Later she picked me up and sat down with me on her lap. She brushed me and massaged me and was shocked when she saw the state of my paws. The pads are dry and cracked, so she rubbed coconut oil onto them. She said you can always tell if a girl is well groomed from the state of her feet. She’s doing so much to comfort me, but I can’t keep the sadness from weighing me down. She said she read about Bach’s Flower Remedies and that she would get some to treat my depression. Meanwhile she’s putting Rescue Remedy in my food. She says she’ll do everything in her power to get my tail wagging again, and not just for Scully. I do hope I’m in a better mood tomorrow. A dog can not help but be in a better mood if the day starts the way mine did. The family has a morning ritual of having morning coffee and tea in bed and I got to partake in it. Dad fetched me from my bed and I ended up spending the first hour of the day wrapped up in Mom’s gown, on the bed between her and Dad with Scully almost nose to nose with me. I could not help but feel treasured. Long after they all got up and busy, I lay there dosing, enjoying the cosiness of it all. (I’ll pretend that the fact that I was mummified in the gown had nothing to do with my staying there.) I was again carried down for breakfast; so different from having to compete with other dogs for a place at the food bowl. Another little ritual that I’m now part of, is what Mom calls “Laptime.” It is when she spends time brushing and massaging me and sharing bits of gossip and information with me. Today she listed the things I can expect in future: sleeping warm, delicious and nutritious food, lots of cuddles, and love, love, love… She also told me what the future doesn’t hold: Scuffles for food, being manhandled by overworked “caretakers”, and dips. Yay! I shall never, ever again be dipped! Mom was too tired last night to write my blog. To be honest, me too. Yesterday started and ended pleasant enough, but I’m feeling a little bit more confident now, and I want to decide whether I want to be picked up or not. And the answer is not. So every time Mom tried to pick me up, I tried to bolt. She let me go everytime, but when it was “Laptime” (that’s non- negotiable) she grabbed my hind leg and held on. I fixed her with a hurt and hateful stare. But she won and I have to admit that I can get used to this daily spa-treatment. She focused on my paws and removed what seemed like years’ gunk matting the hair between my heel and toe pads. There is a lot of pretence going on: She pretends that I’m a very good girl to keep so still while she’s busy with me, and I pretend to relax when I’m actually scared stiff. Did I mention that we have a fire pool? I can see exaccetely how it can be a security measure. I can run to the other side of the pool and when the humans come round the right I go left; when they go left I keep right. If I wasn't so scared it could actually be quite funny. I also graduated from sleeping in the laundry the first night, to sleeping on the landing the next three, to lounging on the couch in their bedroom last night. Mom has to get breakfast ready. We’ll do an update tonight. Promise! I’m slowly settling in. Mom told me this morning that she appreciates my being so independent. She says she’s had independent dogs before. They’re called cats. And although she loved them dearly, she now needs unbridled adoration and appreciation. Afterwards I gave her some silent approval by running towards her before slipping past. I also allowed her to approach me very slowly without my nerves giving in. And when a visitor came tonight, I sniffed her hand. I still try to dodge Mom and Dad when they want to pick me up, but I’m not stupid. Warm and comfy is beginning to get the upper hand over suspicion and fear. Right now I’m on the couch, tucked under a sherpa blanky with Scully snuggled up next to me. Not too shabby. During Laptime today Mom said that it is important to face your demons and that getting my feelings out in a creative way can go a long way to helping me heal. We’ve decided that I should write a poem about it all. So I’m thinking about that. I want to call it a “Puppy Mill Dog’s Lament” and Mom says it’s a good working title, but maybe a better title will present itself. Watch this space! Tonight I spent some time on Dad’s lap while Mom prepared their dinner and I luxuriated in the aromas of home cooked meals and Dad’s hands caressing me. Mom hopes that I’m slowly but surely replacing bad memories of humans with more pleasant ones. As they say in Afrikaans: “Die hoop beskaam nie.” We are all being put to a test in patience. Tomorrow we shall celebrate my first week with them! The week-end was terribly busy with Mom and Dad running errands. It gave me a lot of time on my own. Saturday evening they returned from a restaurant with a doggie-bag for Scully and me. It was the most delicious oxtail stew and Mom mixed the meat in with our food. Yum! I made them very happy by doing something as ordinary as stretching. Until yesterday morning I would freeze in one position when Mom put me down and only when she was at a safe distance from me would I run off with my tail tucked firmly between my legs. But yesterday I didn’t wait for her to leave but gave a looong leisurely stretch - and my tail was up. Mom was SO glad. Just Saturday she complained that I seemed to be resistant to her charms. She said she felt the way she imagined George Clooney would if he stumbled into a lesbian club. Not a single eyelid batting, no swooning… Soul destroying. And then I discovered the “dassies” (hyraxes) that get Scully in such a frenzied state of excitement! Our house is built against the slope of a hill and there are some rocks in the garden. The dassies stay there. I’ve been down to that section of the garden, but there is a terrace I didn’t think of going onto and when Mom carried me out into the garden (if left to my own devices I’ll lie in bed all day) she put me on the wall of the terrace. I smelled something completely new to me. I spent the next hour trying to stare them down, and daring them to leave their rock crevices. That was the first time I barked as well. Since arriving here I’ve just been observing everything quietly. The encounter with the dassies gave my confidence a huge boost and I didn’t feel the need to go back to my bed for the rest of the afternoon. My humans were having a glass of wine at the fire pool and I gave them another treat; I rolled around on my back, kicking the air. I’m beginning to do normal things, and it pleases them a lot. Another first: a little while ago I took a treat from Mom’s hand, something I’ve not had the courage to do. Mom thinks that if I keep up this pace of improving I’ll be a perfectly normal doggie before too long. I’ve been the winner all day long. It started this morning when she was going to pick me up to take me down to breakfast as she’s been doing the past ten days. But this morning I had a sudden panic attack and I bucked in her arms. My head connected with her nose. She’s had an operation on her nose not too long ago and it is still tender. She saw a few stars (not George Clooney!) and let go of me. The whole thing left a bad taste. I don’t know what made me feel so uncomfortable and Mom couldn’t understand the sudden change in my reaction. The rest of the day I dodged her. But just as she started to despair I allowed her to stroke me as she’s done until now and to pick me up again. I know it sounds like I’m being carried around like a baby; that’s not the case. It’s just that Mom wants me to have a sense of routine, and because I don’t react to being called, she carries me down to the laundry for meals with Scully and out into the garden to wee first thing in the morning and for the rest of the day only if I seem to freeze to my bed in a morose state. The one positive about all that dodging was that I was probably more active today than the entire previous week. Maybe even months. After giving Mom a run for her money on Tuesday everything went back to “our” normal. When I’m in my bed she can approach me and pick me up. When I’m in the garden, I keep a safe (for me), frustrating (for her) distance. She was rather apprehensive when picking me up though. She didn’t care for another punch in the nose. I presented her with a perfect photo opportunity yesterday: I rolled around on my back with Scully’s blue blanky between my front paws. But she had neither camera or cellphone handy. Aargh! I missed out on Tuesday’s lap time because of my antics, and yesterday Mom took a friend to the airport and thought it was a good idea to get her new cellphone on the way back. What she thought would take half an hour or so, ended up taking all afternoon and she got back so late that Scully missed out on his walk and I missed out on lap time. Again! She promised to make up for it today. Midmorning Thursday she dashed of to guitar lesson; she’s learning to play the Blues - nogal. (I can tell her a few things about the blues.) Then she went shopping, came back and prepared dinner. “We have family coming to visit”, she told me. They arrived and I heard Scully barking greetings. The sweetest little girl called Lana-Leigh came with Mom to say hello to me. She patted my head ever so gently and then left quietly with Mom. The rest of the evening I heard them talking and a baby crying, but much to my relief I was left in peace. Friday morning Mom received a call that a family member needed urgent help to move from an uncomfortable situation. The rest of Friday and yesterday was absorbed by that. The lady has been staying with us, but today they will be taking her to the weekend cottage at some dam. Whenever they mention “dam”, Scully’s ears perk up. That word, along with “stap” and “dassies” and “wil jy saam kom?” makes him delirious with joy. I also find it very satisfying to do some housekeeping when left to my own devices. I carry the clothes they leave lying around to a central spot and yesterday I moved Scully’s bed into the sun. Afterwards I pulled one of Mom’s tops into it. She says I’m a cutie pie. I’m learning things about myself: I’m very curious about things. Despite being scared, I just couldn’t help it; I had to see what they were up to in the garage yesterday. I peeked around the corner but got nervous whenever one of them saw me. After a last flurry of activity this morning, they left for the dam, leaving an extremely disappointed Scully behind to look after me. My humans returned late afternoon, gave me and Scully our dinner and then had the nerve to leave again! They are hyperactive! When they returned a little while later Mom at last had some one-on-one time with me. She cuddled me and then Scully came and sat with us and she gave us some treats. We are all in bed now, looking forward to a less eventful week. PS: This is me being carried to my breakfast. My mommy calls it the breakfast train. I had some great fun today: Scully and I cornered a rat in a pile of wood. He had the Northern front covered and I protected the Southern side. Scully is famous for his ratting skills. A while ago a rat was cheeky enough to move into the kitchen. Scully put a swift end to that. His reputation now keeps the rats at a respectful distance from the house but they still have free reign of the garden. He’s grateful for my help. My predecessor, Soozee, was far to old of late to be of any assistance in matters of rat control. She lived to the grand old age of seventeen years. Mom said that if I could live so long, we have twelve years together to look forward to. The smallest things I do seem to be a real treat for my humans. I barked twice today; when Mom returned from having coffee with a friend and again during the rat hunt. She couldn’t wait to tell Dad. If only I had the courage to go to them when they call me. Now thát will please them. Yesterday Mom gave me a “dry cleaning”. She used some foaming shampoo -http://www.dermoscent.com/en/p106-essential-mousse.html - to clean my coat a bit. Digging after the rat left both Scully and me a bit smelly. Mom was rather upset with Scully, because she gave him a bath on Friday. She’s also been trimming the silly kilt I’ve been wearing. She finds the Schnauzer cut impractical for our warm climate and also because Scully and Soozee would attract burrs and blackjacks like they were weed magnets. Soozee especially didn’t take kindly to having anyone fiddling in her fur. It always resulted in an exasperated Mom and a sulking Soozee. So while she honours the facial trim, the bodies of her Schnauzers are always given a short haircut all over. I discovered a very nice little hideaway close to where the rat lives. And then Mom discovered me in my hideaway. Eish! Is she half bloodhound? She is completely baffled by the fact that when I’m on my bed she can approach me, pick me up, she’s even turned me on my back to tickle my tummy. But anywhere else in the house or garden I play dodgers with her. She’s eager for me to learn to trust her, because that’s when the fun will start. We’ll go for walks, and visits and travels - but it all will have to wait until I’m more confident around people and about new experiences. A day of firsts: I didn’t have to be carried out to the garden this morning. I was up and about before my lazy bone family. And tonight I surprised Mom when I casually came down for dinner instead of having to be fetched. Late yesterday I got peckish and went through the recycle bin. The recently emptied dog food bag smelled of promises. I’m looking, listening and learning; and I’ll keep on jumping little surprises on them. Mom’s just desperate for me to give her a wag of my tail. Oh, and my poem is coming on nicely. I love it when they rush off to do things because then I have Scully to myself. Whenever my humans are around Scully is sure to follow them like a shadow, leaving me to wallow alone in my bed. Mom tries her best to get me to spend time with them if they are in the garden, but I prefer to keep my distance. Scully and I are still trying to chase the rat from its hideout; without any luck. But it’s great fun nevertheless. Mom loves how my body language changes from timid to daring when I get a whiff of the rat. Scully wanted to play with me Sunday morning and when I gave him a high five he got really silly and jumped on the bed with Mom and Dad. I think he wanted me to follow him. Apparently he and Soozee used to be very entertaining with their games. I had a mishap on the carpet in the lounge. They’ve been keeping the door closed, but when the visitors they had on Saturday afternoon left, they forgot to close the door again. So for now the area is definitely, strictly off-limits to me. Mom says she’ll have to find out from other Rescuers if she will traumatise me too much if she would give me a bath. I am getting rather dirty and a bit smelly, and the foaming shampoo she used before is fine for cleaning beards and paws but far too expensive to clean an entire doggy. Dad took the day off today and he is busy doing repairs around the house. He’s making a frightful noise in the process. Even Scully seems uncomfortable… And now Dad’s gone and cut his hand with the angle grinder of all things. Sounds worse than it is, fortunately. Mom says he almost always draws blood when he does maintainance, because he’s in such a hurry to get the mundane stuff done. And now it’s lap time and then Mom’s fetching the same friend she took to the airport little more than a week ago. I’m beginning to like it here. Tuesday morning Mom massaged and stroked me until I couldn’t keep my eyes open. She turned me on my back so that she could tickle and rub my tummy and I became completely relaxed. I went down for my meals twice this week. Mom knows how brave I am to do that, so I get a lot of praise. But yesterday I thought I was going to die. Mom carried a basket filled with towels into the bathroom. She also had a bucket with a non-skid rubber mat in it. I had no reason to suspect foul play - even when she came to pick me up. Instead of going down the stairs, as we would to go to the kitchen or out into the garden she went the other way with me. I was still fairly relaxed when she opened a glass door and placed me on a ledge with the rubber mat on it. She closed the door and took a picture of me. And then she opened the door again and sat down on the upturned bucket. That’s when I smelled a rat. I started to shake like a leaf. She began brushing me and I relaxed a little. What a strange place for lap time, I thought. Oh, horror! Next she opened a tap and I realised that I’m in a Chinese water torture chamber! I froze. Just like one of those human statues where people go up to them and wave their hands to see if they’ll blink. I also didn’t blink. I hardly breathed. I couldn’t believe her betrayal. I stood there like a guard at Buckingham Palace. She turned the water off and carried on brushing me until I defrosted a little. Eventually she gave one half of me a shower. My one side was pressed into the glass wall of the shower. Scully came along to encourage me. He also hates bath time, but he says if a dog wants to share his humans’ bed with them, it’s a sacrifice you just have to make. I had to point out that I sleep in my own bed. He agreed with me that it was all rather unfair. Mom used the entire pile of towels to dry me really well and afterwards took me out into the sun. We sat there while she fluffed my fur and crooned about how beautiful I am. She said Scully and I seem to be made of precious metals. He has red copper and gold glints in the sun and I have the elegant shimmer of silver and pewter. I remind her of a moonbeam over water. Being so lavishly flattered made me forgive her. This morning she found me on my back in my bed. Utterly at ease. She planted a big, fat kiss on my tummy. She now has to go to guitar lesson and then we have to endure her practising scales, licks and riffs the rest of the week. Ouch! Last night I presented Mom with my poem. She covered her face and cried. She fears that with all that's going on in the world, the plight of animals will always be delegated to the back seat. We plead with all of you who reads this to spread the word: “ There’s really no such thing as the ‘voiceless’. There are only the deliberately silenced, or the preferably unheard.” (Arundhati Roy, as quoted in Leaving Before the Rains Come by Alexandra Fuller p 107.) Please help to make everyone aware of the fact that Puppy Mills are about greed, with NO concern for the welfare of those animals. Don’t buy unless from decent breeders. Better still: ADOPT A RESCUE. And my soul filled with sorrow. Hi. I'm Scully and I am so proud of my new sister RESCUE Jess-Ndo St Madonna. Some people were ugly to her and kept her in a pen just to make babies. My parents adopted her. She is safe now.... She is scared but slowly learning to chill like me! A lot has happened since our last update. I’ll start where we left off. Saturday night the family went to bed early, just to be woken up around midnight by me standing outside, barking my heart out. Dad had to get up and herd me back in. After a little while Mom heard me going through the security gate of the bedroom again. She didn’t know Dad had closed the doggy door, so she was rather impressed that I didn’t go out to bark again. What she didn’t realise was that all that activity had left me rather peckish, I was down in the kitchen to see what I could snack on. There were no leftovers because Scully and I both finished our dinners. But I could smell our food and, tah dah! Found it! Hidden inside a cooler bag was a 4 kg bag of yummy dog food. The zip of the cooler bag wasn’t closed all the way and I got a nose in the bag. That’s like getting a foot in the door. You’re bound to have success. The top of the bag was turned over and secured with pegs, but that proved to be no hurdle at all. I pigged out on as much food as I could eat. They’ve now moved the bag onto a shelf in the pantry and spoiled all prospects of future midnight feasts. Sunday afternoon Scully and I played with the blue security blanket he carries everywhere he goes. Mom, much to her frustration, once again had no means to capture the moment. She says she’ll have to turn into a stalker to capture me on camera. When I act so normal, her heart jumps for joy. Monday we celebrated my first month with them! Mom says it’s been so much easier than she anticipated. I eat very well (as you’ve read) and will even eat with her stroking me softly. The fact that she can handle me and cuddle me is a big plus. I have had only three mishaps in the house; I follow Scully’s lead and poop mostly behind the shrubs and seldom on the lawn. (Will tell you about the origins of this in a future post.) Most nights I sleep through. I increasingly come down to the kitchen on my own for dinners. Yesterday after dinner I didn’t dash back to my bed but spent time in the dining room playing with an old slipper. On the downside, I still won’t take any treats from my humans’ hands. Not even the delicious little biltong bits that Dad tries to bribe me with. And I continue to refuse any contact with them when I’m out in the garden. Although I did allow Mom to approach me with a chewy treat earlier today. She saw me almost half an hour later still gnawing on the corncob. Then there’s the matter of getting me to walk on a lead. She hopes we can achieve that before they go to the Cape in December. Mom read all the previous posts to summarise the past month for this update. She says she spotted a few grammar mistakes. Her sincerest apologies to all the pedants out there who are now suffering from heartburn. I asked her to tell me about the other dogs and cats they’ve had. All will be revealed in future updates. Sorry for the long silence; Mom’s computer had a problem and then she flew down to Simonstown for 5 days. We’ll try and squeeze all the latest news into this update. I witnessed something I never thought I’ll see: A scared Scully. Mom and Dad visited Dad’s family in Potchefstroom on Friday (24/7) and stayed the night. (Dad’s Mom is 95 years old!) Mom arranged with a niece to stay with us doggies, but it was clear that Scully doesn’t like other people staying in our house. I still regard all humans with the same awe, so to me it was much of a muchness. When Mom and Dad returned Saturday afternoon (25th) Scully was just crazy happy. Only when they took him for a walk did he consider forgiving them for not taking him along. He is used to going everywhere with them, but the Potch family has two bull terriers, one being not too friendly and, in any case, Mom wouldn’t dream of leaving me alone, even with a dog sitter. She considers Scully to be my anchor is this strange new experience. The big thing is that I’ve been going along on walks! Dad carries me on his arm and Scully, in his usual full throttle fashion pulls ahead with Mom in tow. This past Saturday Dad put me down next to a rainwater gutter. There’s a family of dassies living there (they’re everywhere in the neighbourhood) and Scully went into full hunting mode when he smelled them. I got all excited as well. For a moment I even forgot about being in a harness and leash. I almost dashed down the stormwater drain. Dad often jogs to the Pretoria Botanical Gardens close to home and the last two times Mom followed with me and Scully in the bakkie. She expected me to be very nervous but I surprised her by standing up and looking out of the window. I seemed completely cool about the drive. Walking there is a lot quieter than the route around the block with all the other dogs barking comments as we go past. Dad says some of those dogs are barkaholics. Late afternoon we went for a walk. Mom wanted to see if I would take a few steps if she waited patiently enough. But no luck. I stood rooted to one spot for sooo long that Dad and Scully went around the block and caught up with us. While we stood there an elderly neighbour tottered past and complimented me. Mom told him of my sad background and he muttered his disgust that people can be so callous and greedy. Then two ladies came along with two darling pocket sized French Poodles. The little brothers were very friendly and bounced around me with enthusiasm. I showed some interest, but even that didn’t get me to take a step forward. By that time Scully and Dad had joined us again and Scully left no sniff unsniffed. Mom uses every opportunity to tell people about the horror of Puppy Mills and she repeated my story to the ladies. Mom took pictures of us exploring the garden which is coming alive with spring just around the corner. There are lizards everywhere! Scully is doing his best to catch one, but they’re simply to quick. Mom warned him that he’ll have to catch and release; she’s heard that lizards aren’t good for dogs. Scully got himself covered in leaves. Mom said he’s a new species called Fauna and Flora. Mom couldn’t get a good one of me; as you know I run away from her in the garden. The sudden warm weather prompted Mom to groom Scully. He now looks very sleek. On Thursday morning I was given my second bath since I was adopted. It went a whole lot better that the first time. Mom didn’t have to rush through it like last time for fear that I’ll die of anxiety, so she used the shower head to massage my entire body. It was pure bliss. She couldn’t groom me as well because the clippers stopped working. Yay! She left shortly afterwards for her guitar lesson and to buy Dad a book for his birthday. When she returned she found their bedroom in complete chaos. She wants Dad to install a camera to spy on Scully and me. I’m a bad influence on him, she says. He never got up to mischief like this. Mom knows that Scully will push the pillows away to lie between them when they are away. That is after all where he slept when he was a baby - between their pillows- but how we managed to get the shoes, especially Dad’s heavy shoe, on the bed is a mystery to her. She bought new slippers, similar to the previous ones. I found them on the shoe stand in the dressing room and again pulled the bows off. In the photo you can see one of them. Sans bow. It also looks from all those paw prints on the bed like we used it as a trampoline. The floor of the bedroom was strewn with similar evidence of a raucous party. We celebrated Dad’s birthday and my second month with them on Friday. Scully got Dad a new toiletry bag and I got him a scarf. That was before summer arrived like a gatecrasher. (I’m now hoping for one last cold spell so that he can wear it at least once this year.) Poor Dad had to attend a funeral on his birthday. Mom wrote to two animal behaviourists about the fact that I don’t seem to improve in my relationship with them. It breaks her heart that I simply don't trust humans. She also needs assistance in getting me to walk on a leash. She says it can’t wait, because they can’t travel with me unless I do. The last thing she wants is to have to put me in a kennel when they go on holiday. So, I’ll have to start putting a brave paw forward. Mom’s been dying to get time to write this update, because she has good news about me. Of late when she takes Scully for his sniff-about ( it’s like a walk, but shorter), she puts me in my harness and leash and just let me drag it along. On Monday she thought she heard me barking when they went round the corner, but couldn’t be sure. But yesterday there was no doubt. When Mom and Scully left the house I followed them. Usually, once outside, I run around the pool to put some distance between us. Not yesterday! I ran along to the gate, and… BARKED! Unfortunately I lost my courage and every time she reached to take my leash, I retreated. Scully became very impatient. I got most upset when they went through the gate without me. I barked my disappointment, so Mom turned back. When she opened the gate I ran to them, but as before, when she tried to get hold of my leash, I retreated, but hey! It’s huge progress! Mom’s been giving us little pouches filled with yummy treats. She takes the empty inners of toilet rolls, folds the one end over, then fills it with pellets tossed through with a pinch of powdered biltong and healthy leftovers. She bends the opposite end in from both sides so that there’s a gap for us to get the snacks out. Wednesday she carried me to the garden, and gave the two of us our pouches. She went and sat on the gras next to Scully with her back towards me. Then she started to slowly wiggle in my direction. On her bum! Wiggle-wiggle until she was close enough to touch me. So, now I’m getting her to do tricks while I’m getting the treats. Not bad, I’d say. If I can get her to do more tricks like that, we can audition for Britain’s Got Talent next year. I also have a trick up my fur; when Mom comes up the stairs, I disappear around the corner. There one second, gone the next! In the previous post Mom mentioned getting the advice of an animal behaviourist, but by the way things are going now, it may not even be necessary. I’m making her proud and very happy. You must all have a great weekend. Mom might have been a little hasty in dismissing the help of a behaviourist. I act a bit erratically. For a while I went down for my dinners; I’ve now stopped doing that. Yesterday I ran away when she took me down for breakfast, but returned a little while later. I make progress and have lapses at more or less the same pace, so it’s like I’m marching on the spot. At least I’m not going backwards. On the walk-front though, it’s all good news. The first few times when Dad would put me down on a walk, I merely collapsed onto my tummy. For the next few walks I would just freeze, one front paw dangling in the air. But the last few times I started to sniff around, even took a step or two and… delighted Mom by taking a wee! She says that’s about as brave a step as the one she took when she joined Facebook! Soon we’ll have a competition on who’s posting the most. Thursday night I ran from the house when it started to rain. Dad braced the weather to get me back inside, but couldn’t find me. Just when they wanted to organise a search and rescue party, I came dripping back into the house. The thunder and lightning reduced me to a nervous wreck. I had to be dried and Mom wrapped me up in dry towels and sat holding me until I stopped shivering. She reminded me that my days of having to endure cold and discomfort were over. Mom’s niece and her family came for brunch Saturday morning and she introduced me to them. I seemed fine with the strangers petting me. Sunday morning our walk went the usual way: Scully ran ahead, pulling Mom along; Dad and I followed at a snails pace. Dad put me down every time Scully smelled something exciting. If I showed no interest, he’d pick me up again. I’ve become a sturdy little girl so he is getting a good upper body work-out in the process. He complained to Mom that I’m heavy to carry and he’s getting impatient with me. Mom said if I don’t start to use my legs on the walks, she’ll have to ration my meals. Then we got to the spot where the dassies keep and it was as if something suddenly possessed me! (Maybe the threat of getting less food?) The minute Dad put me down, I dashed across the road to where Mom and Scully was. I walked! On the leash! And when Scully pulled to where he saw another dassie, I followed so fast that Dad had to run to keep up… I thought he was chasing me so I stopped dead in my tracks. After that I felt less inclined to walk, but my humans were very impressed. So, there Dad! No reason to give up on me so quickly! Sunday afternoon Mom bought a double leash. Maybe if I’m walking shoulder to shoulder with Scully, I’ll be less nervous about it. We’ll keep you posted. I’m not frightened by the vacuum cleaner! ; When Dad switches the alarm off in the morning, I know it’s my cue to get up and run outside with Scully for morning ablutions; Other humans and dogs don’t scare me but I’m still wary of them; I’ve taken to car rides and more recently, boat rides, like - well, a duck to water. I don’t like walking on a leash; I’m still trying to make sense of what the humans are saying - learning commands is a lot more difficult than reading body language; The refuse removal truck and the noisy guys tipping bins into it scare me witless. (Mom gives me treats and cuddles when they come thundering down the street to try to turn the experience into a more positive one.) Big spaces still unnerve me and when outside I need to keep a safe distance. Mom took me to a groomer and I now look fit for the show ring. Dad’s been calling me “Fatty”, but he had to swallow his words. It was just the two inches of fur on me that made me look so plump. The groomer was very impressed with how good I was and she agreed with Mom that I was actually relaxed and not scared stiff. Mom got a few pointers on how to groom a Schnauzer not to look like a Scotty on stilts. When we got home, Scully fell in love with me all over. It feels wonderful not to lug a thick winter coat around. Saturday morning I went on the boat with them. Mom watched me carefully for any signs of panic or stress, such as eyes so big that the white shows (whale eyes) or constantly licking my lips. Once again I surprised them by being utterly cool. I stood next to Mom, (Scully was in his usual spot on her lap) and sniffed the air for lots and lots of new smells: The muddy and slight fishiness of the water, drifts of smoky deliciousness coming from campfires, suntan lotions and happy pheromones. There were also new sounds bombarding my senses: The humm of boat engines, waterbirds quacking, fish splashing back after jumping from the water to catch insects - all backed with the sound of humans enjoying themselves. Mom says the blank expression in my eyes, that bothered her so much, has disappeared. We’ll tell the rest later. Mom wants to send this post before another week is grabbed by history. Last weekend was a busy one for my humans. They left early Saturday morning and returned midmorning with lots of parcels. They had three birthdays in three days to buy presents for. Saturday afternoon Scully and I got bundled into the bakkie and we drove to a park where we met Super Hero Perci and his siblings. They looked like they owned the park and Scully of course acted like he actually invented parks. SH Perci’s dad, Chris Kritzinger (himself a Super Hero for Schnauzers), said Scully was a bodacious guy. I also received lots of compliments and I wasn’t too scared of all the strange humans around. Mom couldn't allow me to run off leash, and with my still not walking on a leash, I just had to hang around the humans and another young Schnauzer girl, Miekie. Then we raced back home, just to get caught up in the throngs of people running a race at the Pretoria Botanical Gardens, which is just around the corner from home. It made my humans late for the party they were going to.The birthday party had a Wild West theme and they hired clothes for that. Mom dressed up as Pocahontas and Dad looked every part the dashing Sherif. I’m so glad I’ve been groomed, because it’s been incredibly hot in Pretoria. Poor Scully, who is overdue for a grooming, keeps to the the tiled areas of the house where he lies sprawled out on his tummy. Mom promised to groom him tomorrow. This morning we drove Dad to the office after taking his car in for a service. While driving, I kissed Mom’s arm three times with little approving licks. She told Dad that when we get home, she’s moving into the bakkie with me, if it means she’ll get kissed more often. And now for the great news: Sunday morning we are going to join a LOT of Schnauzers for the Eridanus park walk! Mom is hoping that being amongst so many doggies will give my confidence a much needed boost. Can’t wait to tell you how it went! Late News! Late News! And dare I say; Great News? ​Mom has declared the 22nd of October a day of celebration! I walked on my leash this morning! The details will be shared but I am happy to report that I’ve passed Walking 101! I’m glad to say that yesterday wasn’t just a flash in the pan. It’s official! I’m walking on the leash. You should have seen Mom yesterday and this morning: She just couldn’t stop smiling. She says she feels like the cat that got the cream. So here’s the story: The last few weeks our routine has been one of; the alarm goes off, I run out to the garden and when my humans are ready for our morning walk, Dad would have to herd me back to my safe spot in the bedroom because I only allow them near when there. But since last week I’ve been a little more accommodating to the family. When Dad approached me I would actually run towards the gate and allow Mom to put the harness and leash on me there. Yesterday I dashed straight through the open gate. Once outside my confidence usually runs out, but not this time. I carried on walking over the road, following Scully and Dad. Mom and Dad exchanged surprised looks. We rounded the corner and I was still walking. But then I got a fright and stopped. Dad and Scully went around the next corner and I started whimpering. Mom encouraged me to follow and after a few tense moments I did. On the rest of the walk I froze twice more and Mom would just pick me up and then put me down wherever Scully was sniffing around with enthusiasm. Each time I would take some time to get going again, but eventually I’d carry on walking. This morning I didn’t dash through the gate. I just stood there crying softly when Scully and Dad went across the road. Mom said: “ O, no Jess. You can’t let us down like this. You made us so proud! Come on, you can do it again.” But I seemed to have send down roots. Eventually she picked me up and followed to where Scully was doing a thorough investigation of a fresh pee posting. She put me down and after that … she didn’t have to carry me again! I didn’t stop when the leash pulled tight, I didn’t freeze if she stepped on a twig and it snapped, I didn’t even get spooked when I went so fast that she had to jog to keep up. I got the hang of this walking thing and it felt wonderful. Scully hasn’t been getting wild with excitement for nothing. This is fun! You can now call me Jessie Walker. I’ll just keep on walking. Mom says we are dedicating this post to all the dog owners who walk their dogs. It makes her sad to see how many dogs just never go for a walk. We live on a big property with lots to explore, but it doesn’t make up for getting out and about. Have a great week-end and go on: make your dogs’ day. Ooo, this has been three busy, busy weeks! In between our daily walks and visits to the dam, it's been a hectic struggle to keep the garden watered. I’ve been doing my bit watering the lawn, but Mom asked me to rather not. Everywhere I piddle the lawn turns yellow. We went to a kind lady called Scotty. She’s assisting the adopters to help us rescue doggies become less scared of humans and to adjust to our new homes. Mom’s been giving me massages, but she got a few pointers (some Tellington -Touches) to up her game, and it’s such bliss that I frequently nodd off during lap-time sessions. Mom noticed that I’m a lot less skittish, although I’m definitely still wary of them. Mom says I shouldn’t rush into things, I need to build my confidence - while breaking down the negative experiences- one positive realisation at a time. And I’m getting there. Apart from walking, I go to both Mom and Dad to accept treats. Saturday night at the dam, I ran back to Mom when Scully disappeared behind a shrub. It was dark and I lacked the nerves to follow him. Mom said she felt honoured. The neighbours at the dam can not believe the progress I’ve made! Their dogs would come for visits and the five of us would sniff each other’s bottoms and then trot about, lost in our own thoughts. Berni, a stout wire-hair fox terrier, played with Scully while Diesel, a bouncy French Bulldog youngster, entertained everyone with his antics. He’s obsessed with fetch-and-bring and he shook a rope toy with such vigour that it’s a good thing it doesn’t have a spine. Mom read this about “Frenchies”: “ …it is a clown in the cloak of a philosopher.” We saw clown aplenty but not much of the philosopher. I must tell you more about my walks, but Mom has other things to do now. It’ll have to wait for the next post. You remember the chow-chow that bit Mom’s bum? I couldn’t help but leave my own - not so polite and very solid- remark on the pavement in front of his house. And Mom did’t bother to pick it up either. She’s still quite resentful that the owner has such disregard for others. I missed this week-end’s walks. My humans went away for a few days. A dog-sitter took care of Scully and me, and she tried to pick me up. I got such a fright that I snapped at her. Fortunately she understood that I’m scared of strangers and after that she would just sit and stroke me gently. She sent Mom some pictures of how I’ve been keeping busy; I shredded a magazine and took apart a fan that Mom’s had for thirty years. She’s angry with herself for not putting it away. It has a lot of sentimental value to her and it’s been so useful in the terrible heat, because it folds up and she could carry it in her handbag. While she’s typing this, I’m lying at her feet under the desk. She says I look like a little angel totally incapable of such acts of demolition. She so wished that I would wag my tail to show that I’m happy when they got back, but her hope was blighted. Next time, maybe? ​Exactly one month from today we are leaving for Simonstown. Mom often reminds me of how relieved and proud she is of my walking on leash because it means that I’m going along and according to Scully it’s even better than going to the dam! We’ll have to see about that, he’s prone to exaggerate. Only two more weeks before we leave on holiday! Mom says she has mountains to move before then. She told me we are going for walks in the mountains in the Cape, so I hope she gets them moved in time. ​Mom’s been running around like a headless chicken. They had a function at the dam for almost a hundred people on Saturday. When Sunday dawned with all of that behind us there was a collective sigh of relief from the Spiese and their Schnauzers. Mom says she can do without crowds of people and Scully and I don’t like to have to compete for attention. It’s great that everything is back to normal. ​Scully wasn’t lying! The Cape is way better than the dam! But I’m getting ahead of myself. We left home last week Wednesday, the 16th and stopped in Potchefstroom to say hi to Dad’s 95 year old mom. Scully and I explored the garden while the two resident Bull Terriers had to watch us from inside the house. Their noses were flattened against the window and they drooled little puddles of desire to join us or eat us. It was difficult to tell which. When we left Potch I just had to ask; was that the Cape? Are we going home now? Nooo, Silly! Scully explained that we still had a long drive ahead of us. About 12 times to the dam and back. “But,” he said, “the long drive is all forgotten when you get a sniff of the sea.” “See what?”, I wanted to know. Nooo, Silly! It’s not WHAT you see. It’s THE sea. Mom told him to stop calling me Silly. She said it’s just because he was still a little puppy when he travelled to the Cape the first time that he didn’t also have ignorant questions. He then collapsed onto a cushion propped between the two front backrests and slept. I decided that he probably knows best and curled up with the entire backseat to myself and nodded of to the soothing humm of the car’s engine. I woke up when we stopped for fuel, but didn’t want Scully to call me Silly again, so I adopted a wait and see approach to figure out if we were at the sea yet. Mom and Dad said we were almost in Kimberley, which rhymes with sea, so I got confused. After taking us dogs for a stroll we got back into the car. I became very anxious. I crawled into the furthest corner of the car and sat there shivering. I wasn’t sure that I wanted to go to the Cape anymore. Mom and Dad seemed tense and tired and she said I shouldn’t be silly. Now she was calling me Silly! She pulled me onto her lap and stroked me until I stopped shivering. I then climbed to the back of the car and carried on sleeping. The next thing I knew was when Scully hopped from his spot to try and jump from the car when Dad got out to greet our host at the B&B where we were staying. “This is Kimberley”, Scully wagged. “There’s a huge cage with birds. We can’t chase them but it’s fun to watch.” I waited patiently for Mom to fetch me from the car and joined Scully on a sniff-about and to study the birds in the enclosure. I was learning fast and evolving into a seasoned traveller. ​I hope I still have a fan or two out there after this long silence. I’m seriously considering to fire Mom as my ghost writer. She neglects my blog. Here, at long last, is an update of my Holiday Memoirs. We left Kimberley about six o’clock the morning of 17 December. Our route took us off the beaten track because Mom wanted to see The Quilt Shed Farmstall in Phillipstown that she read about in the book “Farm Stall to Farm Stall” by Jennifer Stern. It is described as “…walking into a kaleidoscope, or diving over a coral reef.” It meant we would drive through Orania, a place Dad was keen to see. Orania turned out to be neat as a pin and so quiet you could hear one drop. On a little outcrop busts of the Presidents and Prime Ministers of the old South Africa stood like watchful sentinels. We parked there and then walked down the hill to a memorial honouring Irish Soldiers fighting in the Anglo Boer War. After this flash course in history we drove on to Phillipstown to have breakfast at The Quilt Shed. Alas, when we got there, The Quilt Shed had closed down and in it’s place was a sad little shop of achromatic neglect. And then we spent what seemed like an eternity driving and driving…and driving. Even Scully who is usually upbeat about everything seemed depressed. Mom thought there was something wrong with him, but Dad said us dogs always become lethargic on such long drives. Turned out she was right. Just when I thought the Cape was a mirage we were chasing, Scully sat up and sniffed the air. He climbed into Dad’s lap and Dad opened the car’s window for him to look out. I smelled a great many new smells. One look at Scully and I knew; It had to be the sea and mountains I’m smelling! Yay! We were in the Cape! ​On the morning of the 18th, we went for our first walk in the mountains. Every time Scully ventured from the path Mom would call him back sternly. This is puff-adder world, she reminded him. It was difficult to keep up with him at first. I lost my footing a few times and crashed into the same “fynbos" Scully seemed to just glide over. He jumped onto and over rocks with the greatest ease and then disappeared from sight, causing me to panic and set off in any direction. Back at the cottage Mom gave us the mining rights to dig after the mole-rats that have turned what little lawn there was into a sandpit. We sank six shafts in no time at all. ​When Mom saw that our tunnels were deep enough to go under the fence and I started disappearing down the holes I dug, she tried to put a stop to our mining activities. But we could dig faster than the humans could fill the shafts. It turned into a battle of digging and filling. We won each battle, but the humans won the war by eventually putting strong smelling camphor cubes down and around our shafts. Spoil sports! The next morning when I wanted to carry on with the excavations, Scully opted out. He kept shaking his head and gently scratching his right ear. The night before he threw up and when we went for the walk in the mountain he didn’t bark in excitement as usual. The humans exchanged worried looks. It’s not only puff-adder country, there are also deadly ticks lurking. So, off he went to the Vet. The Vet saw what looked like a piece of grass in his ear. The Vet said she would have to sedate him to remove the grass, and Dad came back home without Scully and with a heavy heart. When we fetched him later, the “grass” turned out to be matted hair. Mom said she felt like such a terrible parent. ​Scully was definitely not himself and he remained subdued for another day or two. The first morning we were taken to the beach, Mom was really worried. They usually just see flashes of him galloping up and down the beach, but he kept to an easy trot, often returning to her and Dad for reassurance. We were all really relieved when he went back to being his bubbly self. ​It’s just as well Scully wasn’t in top form when we went to the beach the first time. There was so much to take in! Was there ever a place that filled the senses the way the way a beach does? The cool, soft sand underfoot, the fresh sea breeze ruffling through one’s fur, the gulls with their piercing screeches and the smells… Ooo, the smells. The seaweed was our best! Scully and I would take our time studying the curled ribbons that have such strong animal odours that it’s difficult to believe they are actually plants. I enjoyed the beach trips so much that, for the rest of the holiday, whenever I realised we’re going to the beach, I would do my jolly jive right there in the car.It gave Mom tears in her eyes to see me so happy! ​On our mountain walks Scully would sometimes race off into the bushes, not paying any attention to being called back. When I caught up with him, without fail, there would be a tortoise. Scully said they were his pet hate because when he was a little pup, one gave him a terrible fright. He thought it was a strange smelling stone and when he went to investigate, the stone hissed at him! He did a somersault and to add insult to injury, Mom and Dad laughed at him. To this day they entertain people with the story of how he managed to jump up, back and around in one swift move. They started calling tortoises “hissing stones” (Blaasklippe in Afrikaans). Scully showed me how to flip them on their backs. He tried his best to pick them up, but couldn’t get a proper grip. I barked encouragements. Dad had to rush after us to rescue the poor tortoises by tucking them under a shrub so we couldn’t carry on tormenting them. We’d go back to the path, but before long Scully would be off again. He could smell them meters away. He’s an amazing scout. He can also be completely unruly. On one walk he smelled other dogs and he charged off to meet them, with me in hot pursuit. We tracked the dogs all the way to the dam at the end of the route. There were three of them, all big dogs, playing in the water. Mom said Scully’s bound to run into trouble one day if he keeps on doing that. But this time the introductions went well and when the humans finally joined us, the other dogs were back in the water, retrieving sticks and having loads of fun. Dad asked their humans if they had perhaps seen two sets of lost Schnauzer ears, because our ears have gone walk-about. The next time we did that, Dad didn’t have much of a sense of humour left. We were put on leash and on leash we stayed. On 27 December we had lunch with the Kritzingers and Chettys and their Schnauzers. The visit was shared on Facebook, so I guess it’s old news. I can’t say I enjoyed that . If I have to be amongst so many people I need a safe spot. This place was noisy and crowded and it was hot. But Mom believes that the more things I get to experience the better. I need to erase the memories I have of humans being callous bullies. A few times the humans would go off for a few hours to have lunch with friends and I would get up to my usual mischief. I chewed the buttons off a scatter cushion and carried another cushion from the bedroom into the lounge. I also discovered a box with colouring pencils and took bites out of all three brown ones. They tasted horrible, not at all like the chocolates I thought they were. Then, on the 2nd of January Mom fetched the suitcases from the garage and started packing. That was much too soon for my liking. Scully said we should keep a low profile, because she’s not in the best of moods when she has to pack up. It obviously was too soon for her liking as well to be going home. ​Mom and Dad went on a skiing holiday last week and despite her promises to write the last part of my holiday memoirs before they leave, she started running around like a headless chicken and never got around to do it. But, it’s rather nice to relive the memories now, more than a month later. The morning of our departure (4/1/2016) we went for a last walk on the beach. If Mom had a tail, I’m sure it would have drooped like mine does when I’m feeling scared and insecure. She would love to live in the Cape but unfortunately Dad’s work requires that we stay in Pretoria. By midday everything was packed and we started heading back North. We were going to sleep at Travalia, between Beaufort West and Three Sisters. Scully told me they’ve stayed there a few times before and that it’s nice, but not as nice as Five Acres in Kimberley where we could explore to our hearts’ content. There are ducks at Travalia so we had to stay on leash. Travalia does room service and the humans had their dinners waiting for them when we got there. The evening was still so hot that they didn’t want to dine inside, but also didn’t want to leave us alone in the stifling room, so our leashes were tied to the legs of the trestle table on the stoep. Scully sulked for a minute or so and then started to explore the area his leash could reach. I sat there with every fibre of me showing my distress. But then I decided that if Scully can explore the two squares his leash can reach, I suppose I could too? With us more at ease, the humans were able to relax and Dad went into the room to fetch them some wine. And then Mom caught a movement from the corner of her eye. She saw something scurrying into the room! Dad’s evening was about to become very unpleasant. Whatever ran in there had to be identified and removed. Dad started pulling furniture away from the walls. The culprit turned out to be a humongous Red Roman spider. It raced up the wall and crawled behind the curtains and summarily went missing. “I’m not sleeping in there with that spider on the loose,” Mom declared with a squeak. “They’re harmless”, Dad tried. “I don’t care if they’re angels incarnate, I’d rather sleep in the bakkie.” Mom took Scully and me and started doing laps around the grass in front of the chalets. In doing so she met some of the other guests enjoying the cooler air outside. She told them about the spider and me being a rescue from a puppy mill. If we did more laps she probably would have told them her entire history. (And revved them up about puppy mills!) Eventually the noise of furniture being pushed around in our room ceased. Dad joined us and told Mom that the spider must have run from the room because he couldn’t find it. Mom remained adamant. She needed proof that the spider left and of course Dad couldn’t produce any such evidence. Poor Dad had no choice but to enter the spider’s den once more. Lucky for him the spider presented itself. Not so lucky for the spider, though. With no way to catch it, Dad had to kill it. He doesn’t like killing things unnecessarily, so he was a bit peeved with Mom. Mom insisted that desperate times call for desperate measures. After that, of course, the door and windows had to remain shut tight. The aircon rattled like asthmatic lungs. It was going to be a looong night. At first light the next morning, we left. The humans stopped in Britstown for breakfast and we were taken for a walk to relieve ourselves. When it was time to leave, I hadn’t done my business yet. We hadn’t driven far when I started panting anxiously. Mom said it was because I needed to poo. The hunt for a spot to pull over started. A suitable shady area appeared only kilometres further. We stopped and got out into a thermo-fan oven. When I eventually produced a neat pile of droppings, Mom and Dad cheered: “Yay, Jessie scored! Hooray for Jessie!” We drove on and I stopped panting. Mom’s too clever for her shirt. The rest of the drive was without incident. The humans lamented the dry and hot summer. Entire areas we drove through after Kimberley looked like it was turning into Kalahari- desert. Then we arrived back with the family in Potchefstroom where we were going to stay for the night. There were a few tense moments when Scully was introduced to the two Bull Terrier girls but they turned out not to have an appetite for Schnauzers. I was in the bedroom with Mom, so I missed out on meeting them. Maybe next time? When we got home on the 6th of January I retired to my familiar safe spot and began to reflect on the glorious experience of a holiday in the Cape. Mom says there’s a good reason why March is called March. It’s the month when people say to each other: “Time is marching on. Can you believe it’s March already? Goodness, before we know it, another year will be gone.” Silly humans! The five years of my life that was spent in a small puppy mill run, went like this: The days drag sluggishly by and the nights, especially in winter, seem endless. In summer you are only to glad when the scorching sun retreats and makes way for a cool night. In winter you can not wait for a freezing night to pass and the sun to rise so you can thaw. Even now, in this new life, I can’t wait for evening when Dad gets home because he’s a lot more generous with treats than Mom. And the nights can’t pass quick enough so we can go for our morning walks. So, if you always have something to look forward to, time passing is not a bad thing. Although, really Mom! So much time passing between my blog updates is a thoroughly bad thing. In Mom’s defence, she has been writing about me, just not updates for the blog. She’s had to squash what she wants to say into far too few words. As Samuel Clemens said: 'I didn’t have time to write a short letter, so I wrote a long one instead.’ It’s not been easy to condense my story into 300 or 800 words. The 300 word piece will be published in a future copy of Canine Zone and Mom wants to send the 800 word one to Kwarts Publishers, who are going to publish a book on happy rescue endings. The proceeds of that book will go towards Woodrock Animal Rescue. I have a soft spot for Woodrock because that’s where Mom and Dad fetched me from all those months ago. It’s almost as if Woodrock has been the launching pad for the good life I’m living now. So, keep your fingers crossed that my story gets accepted. If more people know about puppy mills, maybe there will come a time when no dog will be subjected to those unbearable conditions. Because I’ve been the focus of her days, she’s been jotting down all the cute things I do of late. She’ll share them in the next update.